YANGON -- Myanmar has only been able to verify 374 Rohingya Muslim refugees for possible repatriation from Bangladesh, officials said on Wednesday, blaming their neighbor for not providing the correct information about the refugees. Myint Thu, permanent secretary at Myanmar's Ministry of Foreign Affairs, said officials had checked documents handed over by Bangladesh in February relating to 8,032 refugees. "Out of 8,032, we verified 374. These 374 will be the first batch of the repatriation," Myint Thu said at a news conference in the capital, Naypyitaw. "They can come back when it's convenient for them." The documents were "not in line with our agreement", police Brigadier-General Win Tun said at the same news conference. Myanmar had found three "terrorists" among the people Bangladesh was proposing for repatriation, Win Tun added. Bangladesh officials have expressed doubts about Myanmar's willingness to take back Rohingya refugees. 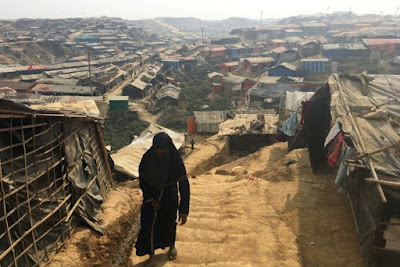 Abul Kalam, Bangladesh's Refugee Relief and Rehabilitation Commissioner, said he could not comment in detail because he had not yet received Myanmar's response. But he questioned how more than 300 people could have been verified if the documents were in the wrong format. The head of an U.N. fact-finding mission denied visas by Myanmar and a special envoy on human rights in Myanmar who has been blocked from visiting the country, both spoke in Geneva on Monday. Yanghee Lee, the envoy, said atrocities against the Rohingya in Myanmar "bear the hallmarks of genocide". "We have a clear conscience," said Aung Tun Thet, coordinator of a public-private partnership set up by Suu Kyi to rehabilitate Rakhine. "There is no such thing in our country, in our society, as ethnic cleansing, and no genocide."